Copyright © 2013 Real Pits No Bull Kennels | american pitbull terrier breeders. All Rights Reserved. We breed and sell real pitbulll blood dogs here at REAL PITS NO BULL KENNELS. 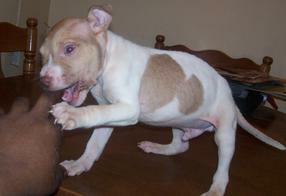 As American Pitbull Terrier breeders we have both Red Nose and Blue Nose Pitbulls for sale. We chose to engage in the breeding and sale of these dog breeds due to the great love we have for this type of breed and the determination we have to show the whole world how great the American Pitbull Terrier breed is and could be. We are currently located in Greensboro, North Carolina and have been operating this business successfully for over a decade. We specialize in the American Pit Bull Terriers because if it is bred correctly it is the best pound for pound dog in the world. If you’re an experienced dog man or woman who understands the American Pitbull Terrier breeds then you’ll love these dogs. If you’re new to the breed we encourage you to learn more about American Pitbull Terriers; they are great dogs once you understand them. We want to sell our puppies to people who have a genuine love for dogs and would take good care of them and handle them well each and every day. Our dogs are registered with several dog clubs like the United Kennel Club (UKC), Bonefide Kennel Club (BFKC), and American Dog Breeders Association (ADBA) and they range in weight from 30 -55 pounds. We accept credit cards for customers making purchases and there is the option of shipping the dogs at the buyer's expense if they are unable to come and pick up the dog. If you love this type of dog, then you are at the right place and you ought to contact us at 336-549-4765 or simply e-mail vance@realpitsnobull.com. We will be available and ready to help you find the right dog for your family. We offer top quality Blue & Red Nose PItbulls for sale. Get the best American Pitbull Terrier breeds from us and you will be smiling all the way home.